The next time you find yourself wandering amongst an Autumn Aspen grove, I highly recommend viewing the trees from the Forest floor. Find an open patch of ground and then proceed to lie down on your back looking up. 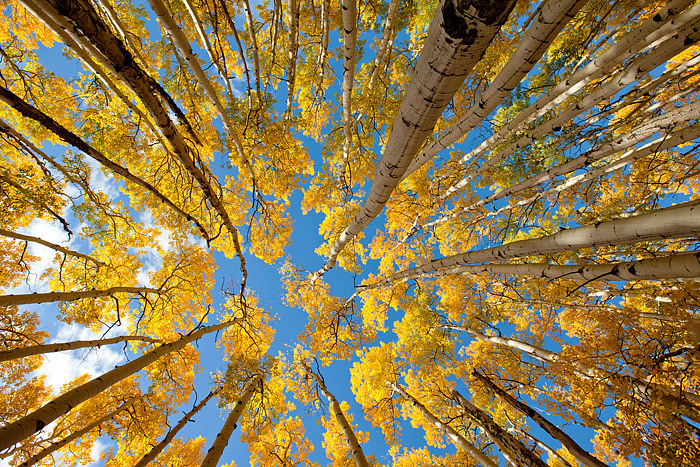 Following the Aspen boles as they appear to reach the sky culminated with shimmering golden aspen leaves against a cobalt blue sky will make anybody smile at the moment. These particular Aspen's along the Bierstadt Moraine in Rocky Mountain National Park, made for just such an experience. I was so caught up photographing these trees, that a herd of Mule Deer almost walked right over me while I was on my back photographing. Needless to say, both myself and the Mule Deer had a bit of a scare once we discovered each other. Photo © copyright by Thomas Mangan.